Dandruff is one of the most common scalp problems with a large section of individuals suffering from it. Be it due to extremely dry skin and scalp, poor hygiene, excessive usage of hair styling products or due to some underlying skin or health concern, whatever be the reason, there is no denying of the fact that dandruff can be very irritating. And if you have dandruff, the faster you are able to get rid of it, the better you will be able to save yourself from the public embarrassment and irritation. If you are having dandruff issues and wondering if there are natural and effective remedies for dandruff removal then here’s the post you can’t afford to miss. As today, I am sharing a list of 9 such magical natural home remedies for dandruff removal that simply works. Dandruff removal is a big commercial industry and here are various brands of anti-dandruff shampoos available in the market that promises overnight miracles. But most of them end up drying your hair even more. So, undoubtedly, it is always better to go safe and use ingredients that are natural and effective. And, when it comes to natural cure for dandruff removal, it is hard to beat the natural remedies available. Hence, if you are pissed off with the dandruff problems, then read on discover how you can use natural home remedies for dandruff removal. I have tried many of these remedies myself and I can confirm that these remedies are magical, and that it works. Long before the existence of medical science, it was Ayurveda which was the saving grace for mankind. Starting from curing health concerns to skin issues to hair issues, Ayurveda was a predominant part of human existence. Sadly, with the emergence of medical science, the popularity of Ayurveda reduced. But those who know its roots would understand how significant it still is for the humans. Even when science and medicine fail, it is Ayurveda which has come to man’s help. So, the importance of Ayurveda and natural remedies can’t be underestimated. And, as far as our present topic of discussion on fighting dandruff goes, there are effective ayurvedic remedies for that as well. Dandruff is a serious concern. Although it is not life threatening or something like that, but it is definitely a kind of a reminder to your unhealthiness and is obviously something that can make you a laughing stock. Thankfully, by the end of today’s article, you will get to know about various natural home remedies for dandruff removal. Our hair is a part of our external beauty. But, it is not just the length or the volume that matters, but the quality of your hair is equally important. And, if you have to have that good quality hair, you need to get rid of dandruff problems. Because dandruff can badly hamper your hair quality, texture and it can also lead to severe hair loss. It is very disgusting not just for the onlookers but also for the individual suffering from it. 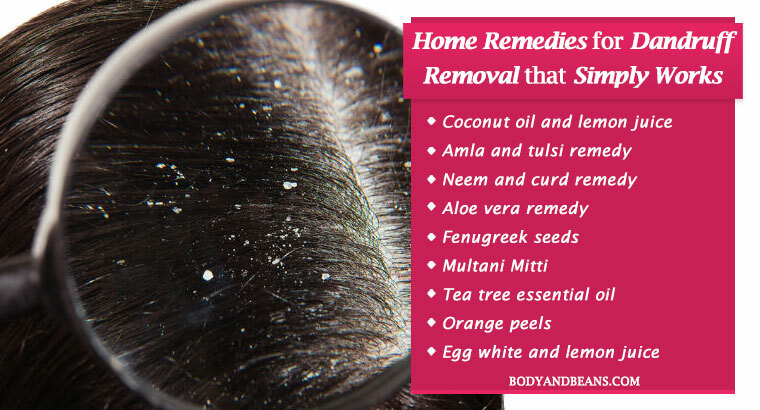 Luckily, the Ayurvedic home remedies for dandruff removal can help you get rid of it fast and naturally. Listed below are a few of the best natural home remedies that’ll help you to remove dandruff fast and without hassles. So are you ready to explore the remedies? The very first natural home remedy for dandruff that I would like to discuss is the coconut oil and lemon juice remedy. It’s not a secret that lemon is surprisingly good for our hair. It not just helps you get rid of the dandruff, but also brings that natural glossy shine to your hair. However, lemon can make your already dry hair drier, so to balance the effects, it is best to use it along with the nourishing coconut oil which will not let your hair get too try. You just have to take adequate amount of coconut oil and then mix some amount of lemon juice in it. Apply on your scalp well. Let it stay for about 25-30 minutes and after that, wash your hair using a mild shampoo. This is a great remedy for dandruff removal, and if you use it for at least 2 weeks, you will notice the difference yourself. Repeat the process 3 times a week and you will be able to get rid of dandruff easily. The next in list of the top home remedies for dandruff removal is the amla remedy. The primary reason why this remedy is so effective is because of the presence of Vitamin C in it which cures the dryness problem and also prevents the dandruff formation. Amla being anti-bacterial and anti-inflammatory in nature further helps in the process of dandruff removal. In addition, the amla remedy is also effective in solving the problem of itchy scalp that accompanies dandruff. So, in short, amla is a total end to end remedy for dandruff issue and so, you can definitely consider it. Take some amla powder and mix it with adequate water to form a paste. Then take around 8-10 tulsi or basil leaves and after grinding them, mix it with the amla-water paste. After that, apply the mixture evenly on your scalp using your hands. Let it stay for about 30 minutes and then wash your hair with normal water. Applying this remedy 2-3 times every week will help you get rid of dandruff easily. During my dandruff days, I used the neem remedy and trust me it really worked well for me. The primary reason why neem is so effective in removing dandruff is because of its antifungal nature which helps a lot in fighting the pathogens leading to the dandruff problem. I will personally recommend you to use curd or yogurt in this remedy as it will enhance the good effects and will also make your hair healthier in general. Plus, curd/yogurt gives a soothing feel which is also very relaxing. See, you will obviously get neem oil in the market and you can easily buy from there. But, if you want you can make a neem hair mask at home as well which I personally prefer. For that, you just need to grind the neem leaves and then mix it with adequate water and curd to form a paste of smooth consistency. Apply the mixture after that all over your scalp and allow it to stay for around 15-20 minutes. After that, rinse using water. Apply this remedy 2-3 times every week to get the maximum benefits. Aloe vera is highly popular as far as Ayurveda goes and why not, it is one ingredient that has got a number of benefits including hair care benefits. Studies have shown aloe vera to be a great anti-inflammatory and anti-microbial agent, both of which helps a lot in dandruff treatment. Moreover, it has a very cooling effect which soothes your itchy scalp as well. So, you can definitely consider using it in order to get rid of dandruff and other common hair issues. You just have to extract the gel from the aloe leaves and then apply it evenly on your scalp. You may do it before going to bed on a regular basis and then let it work overnight. Wash off your hair the next morning and it should help you get rid of dandruff soon. Fenugreek seeds are very effective in removing dandruff, thanks to the presence of the nicotinic acid and several healthy vitamins, proteins which helps in the prevention of several hair conditions like hair fall, baldness, drying of the hair as well as dandruff. In fact, “Research Journal of Pharmaceutical, Biological and Chemical Sciences” have already stated dandruff removal as one of the essential benefits of fenugreek seeds, so it’s worth trying. Take around 3 tablespoon of fenugreek seeds and soak them in water the night before. The next morning, use a blender to blend them into a paste. Now, for enhancing the benefits, it is good if you add a little amount of lemon juice in it. Mix the two ingredients well and then apply nicely on your scalp and also on the ends of your hair. After 30 minutes, remove it and rinse your hair well. Use the remedy on alternate days to get maximum benefits in removing dandruff. The other natural ingredient worth considering for dandruff removal is the Fuller’s Earth or Multani Mitti as we call it in Hindi. The primary reason why it is recommended for dandruff removal is because it is very useful in cleaning all of the grease, oil, dirt etc. from your hair which may otherwise lead to the occurrence of the dandruff problem. It further improves the circulation of the blood which aids a lot in the whole curing process. Use it with the beneficial lemon juice to get maximum benefits. Make a paste using around 1 cup of Fuller’s earth and enough water. Then take around 2 tablespoons of freshly extracted lemon juice and mix it with the paste. After that, apply the mixture on your scalp, leave it for about 20 minutes and then wash off your hair using a mild shampoo. Use it 2 times every week to get remarkable improvements in dealing with dandruff. Essential oils have gained a lot of popularity in recent times due to their efficiency in solving a whole lot of human health and beauty problems. And in case of dandruff also, you have one essential oil that you can easily trust. Tea tree oil with its anti-inflammatory and antifungal characteristics will be absolutely great in putting an end to your dandruff problem. It also has got a higher dermal penetration which is even more favorable. Studies have already been performed and it was seen that the individuals who used 5% tea tree oil shampoo for about a month experienced around 41% reduction of their dandruff in comparison to others who saw a reduction of mere 11%. So, you can definitely give it a try. After all, tea tree oil is a great antiseptic and hence is good in fighting the infections. The process of using tea tree oil is really simple. Just take a little amount of shampoo and pour it in a container. Mix a few drops of tea tree oil in it. After they have blended well, apply the solution in your scalp. Keep it for 5 minutes and then wash off. Use it on a regular basis to remove dandruff easily. In case you have a habit of throwing the orange peels once you have eaten the fruit, please think twice from the next time before doing it as those peels can actually serve a lot of your purposes including solving your dandruff issues. Surprised? Well, you heard it right, orange peels are one of the best natural ingredients for dandruff removal, and you can surely give it a try. Orange peels are effective in dandruff removal because of its mild acidic characteristics which help in conditioning your hair and in reducing the excess oil from your hair and scalp. And, it actually helps in the prevention of the dandruff occurrence. If you are seriously looking for pure magical remedy, then use it along with a little amount of lemon juice to get rid of dandruff fast naturally. Take some very dry orange peels and then put them in a food processor. After that, add around 5-6 tablespoons of freshly extracted lemon juice in it and blend them perfectly into a smooth paste. Now, apply it evenly on your scalp and let it stay for about 25-30 minutes before you rinse your hair with a mild shampoo. This is a great remedy for dandruff removal. If you apply this remedy 2-3 times every week, you will see very fast and significant improvements in dandruff condition. If you are not suffering from dry skin issues and if too much of oiliness in your scalp is causing your dandruff problem, then you can consider using the egg white and lemon juice remedy for dandruff removal. Egg white will supply your scalp with the lacking protein and the dandruff will disappear very soon. Your hair will also get Vitamin C which provides protection from the free radicals causing oxidative stress. Moreover, Vitamin C also leads to better circulation and collagen that further improves your scalp health. Pour the freshly extracted lemon juice in a container and then add 2 egg whites in it. Mix the two ingredients well and then apply it well on your hair and scalp. Keep it for half an hour and then wash off your hair. Make sure you do it 2 times every week to get the maximum benefit in removing dandruff. Even if the natural remedies for dandruff removal as discussed above works great, and you can use these natural cures when you are already suffering from the dandruff. But what if, I tell you that you can actually avoid dandruff in hair permanently? Well, that’s true. As I always say that prevention is a hell lot better than the cure, so I would like to suggest you some tips on how to avoid dandruff in hair permanently and here we go. Dehydration leads to a lot of dryness of your scalp and hair and that is one vital reason to your dandruff occurrence. So, please make it a point to drink enough water and keep your system hydrated all the time. If you keep yourself hydrated, you are likely to avoid dandruff for long. Excessive dryness in your hair and scalp leads to dandruff formation and sometimes also causes itchiness in the scalp. So try out various natural remedies to get rid of the dry frizzy hair. You can also use homemade conditioners to keep your hair smooth and nourished and that should help you avoid dandruff to a good extent. Oily hair and scalp can also trigger the occurrence of dandruff, so in order to prevent it you need to get rid of the excess oils from your hair and scalp. You may like to check my earlier post where I have discussed different remedies in detail that’ll help you in taking care of oily hair and scalp. Your hair is exposed to so much of harshness on a regular basis, and so, if you are not taking enough care of it time to time, then it will lose its charm and you will start facing lot of hair and scalp problems with dandruff being one of them. So, it is seriously important to stick to a good hair care routine and here’s a post that’ll help you. Sometimes, if you do not wash or shampoo your hair properly, then that becomes the reason behind the dandruff formation. So, it is necessary that you use the right techniques of washing your hair and protect it from the damage. Eating healthy meal will keep your hair healthy for long. So, please make sure you are eating a balanced diet so that your system is getting all the necessary nutrients needed to keep it functioning at optimal level. And, yes, do not forget to include the foods in your diet that are especially beneficial for your hair and here’s post hat list best foods for hair growth. It is Ok to style your hair in various ways. But you should be careful and not over style your hair. Avoid damaging your hair with those harsh hair products like dryers, strengtheners, and curlers etc. that leave your hair frizzy and weak. See, if you have naturally good hair, there is no need of using those products. Instead opt for hair styles that are naturally stylish. Also, when it comes to coloring your hair, you can go for the ingredients that help in coloring your hair naturally instead of the market-based hair color products that contain a lot of chemicals and cause harm to your hair. In this world, it is hard to stay calm and relaxed but you should try to do it because it is good for your health as well as in the prevention of your dandruff problems. You can go for mediation or take up stress reduction techniques to see how things work. Also, go for the natural ways to keep yourself mentally boosted and charged all the time. Over to you: which is your favorite remedy for dandruff removal? Dandruff is a very irritating scalp problem and is a matter of great humiliation as well. So, it is important that you fight the problem as quickly as possible. There are many anti-dandruff shampoos available in the market but not all of these are effective. In fact, many end up drying your hair all the more and hence it’s better to depend on natural shampoo or ingredients to get rid of dandruff. It makes more sense to concentrate on remedies that are natural, safe and will give you long term benefits in dealing with dandruff. I have already shared a few of the best natural remedies for dandruff removal and if you apply these remedy properly and repeatedly, you will be get rid of dandruff fast. Some of the ingredients used in the remedies above have already been proven by science to be effective. So feel confident in using these ingredients and remedies for dandruff removal. It’s not wise to expect overnight miracle in dealing with dandruff as many market products promise you. 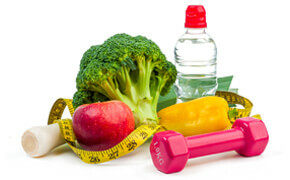 But you will definitely get fast results if you use the ingredients and remedies diligently for a few weeks. Moreover, the ingredients are in general good for your hair as well, so besides getting rid of dandruff, they will also help you in improving your hair quality, growth and texture. However, it’s always better to avid the occurrence of dandruff and I have also talked about how to avoid dandruff in hair. I think it is important for you to know these tips because then you will be able to avoid the dandruff and you may not need to try these remedies. If you like to go natural, then these are definitely going to be the best remedies for dandruff removal that you could try. So, try some of these remedies and share your feedbacks and experience by commenting below. Also, if you use are using any other home remedy for dandruff removal that works, do let me know that as well by commenting below. Until then, believe in natural ingredients and say goodbye to dandruff days.